A homology model of the dimeric TRB1 protein (top, rainbow colored cartoon, N-terminus = blue, C-terminus = red) complexed with double strained DNA (bottom) based on the crystallographic structure of TBX3. Tbr1, along with Pax6 and Tbr2, has a role in glutamatergic projection neuron differentiation. Glutamatergic neurons express receptors for the excitatory neurotransmitter glutamate as opposed to receptors for the inhibitory neurotransmitter GABA. The transition from radial glial cells to postmitotic projection neurons occurs in three steps, each associated with one of the aforementioned transcription factors. The first starts out with the expression of Pax6 in radial glial cells found primarily at the ventricular surface. In the next step, Pax6 is downregulated and Tbr2 is expressed as the cell differentiates into an intermediate progenitor cell. Likewise, in the final step, Tbr2 is extremely downregulated to undetectable levels as Tbr1 signals the transition into a postmitotic projection neuron. In cultured hippocampal neurons, Tbr1 and calcium/calmodulin-dependent serine kinase (CASK) interact with CASK-interacting nucleosome assembly protein (CINAP) to modulate the expression of N-methyl-D-aspartic acid receptor subunit 2b (NR2b) by acting on its promoter region. NMDA receptors are composed of two subunits, NR1 and NR2. Tbr1 is a transcriptional regulator of NR1 as well. TBR1 has been implicated in alterations in the brain that may lead to Alzheimer’s Disease (AD) and Parkinson’s Disease (PD). TBR1 expressing mice showed that cholinergic neurons of the basal forebrain (ChBF), the degeneration of which are involved in the development of AD and PD, migrate from the ventral pallium to the subpallium. This was confirmed using TBR1 null mice. In the future, the researchers plan to explore the role of amyloid precursor protein (APP) in neuronal migration and linkage to these diseases. TBR1 expression has been shown to be downregulated by embryonic exposure to cocaine. Prenatal cocaine exposure in a mouse model caused a decrease in both GABA neuron migration from the basal to the dorsal forebrain and radial neuron migration in the dorsal forebrain. This exposure also decreased TBR1 and TBR2 expression. However, further research showed that cocaine exposure only delayed TBR1 expression and did not cause permanent downregulation. Therefore in models of prenatal cocaine exposure both migration and maturation of these progenitor cells is delayed. ^ Hevner R. "Human TBR1". Transcription Factor Encyclopedia. Centre for Molecular Medicine and Therapeutics, The University of British Columbia. Retrieved 2011-12-08. ^ a b c d "Entrez Gene: T-box, brain, 1". Retrieved 2011-11-01. ^ a b c d e Bulfone A, Smiga SM, Shimamura K, Peterson A, Puelles L, Rubenstein JL (July 1995). "T-brain-1: a homolog of Brachyury whose expression defines molecularly distinct domains within the cerebral cortex". Neuron 15 (1): 63–78. ^ a b Hsueh YP, Wang TF, Yang FC, Sheng M (March 2000). "Nuclear translocation and transcription regulation by the membrane-associated guanylate kinase CASK/LIN-2". Nature 404 (6775): 298–302. ^ a b c d e f Hevner RF, Shi L, Justice N, Hsueh Y, Sheng M, Smiga S, Bulfone A, Goffinet AM, Campagnoni AT, Rubenstein JL (February 2001). "Tbr1 regulates differentiation of the preplate and layer 6". Neuron 29 (2): 353–66. ^ Englund C, Fink A, Lau C, Pham D, Daza RA, Bulfone A, Kowalczyk T, Hevner RF (January 2005). "Pax6, Tbr2, and Tbr1 are expressed sequentially by radial glia, intermediate progenitor cells, and postmitotic neurons in developing neocortex". J. Neurosci. 25 (1): 247–51. ^ Chung WC, Huang TN, Hsueh YP (2011). "Targeted deletion of CASK-interacting nucleosome assembly protein causes higher locomotor and exploratory activities". Neurosignals 19 (3): 128–41. ^ a b Wang TF, Ding CN, Wang GS, Luo SC, Lin YL, Ruan Y, Hevner R, Rubenstein JL, Hsueh YP (December 2004). "Identification of Tbr-1/CASK complex target genes in neurons". J. Neurochem. 91 (6): 1483–92. ^ Hevner, Robert (August 10, 2011). "TBR1: Homo Sapiens T-box, brain, 1". ^ a b c d Han W, Kwan KY, Shim S, Lam MM, Shin Y, Xu X, Zhu Y, Li M, Sestan N (February 2011). "TBR1 directly represses Fezf2 to control the laminar origin and development of the corticospinal tract". Proc. Natl. Acad. Sci. U.S.A. 108 (7): 3041–6. ^ Yonel-Tamura S, Tamura K, Tsukui T, Belmonte JCI (February 1999). "Spatially and temporally-restricted expression of two T-box genes during zebrafish embryogenesis". Mechanisms of Development 80 (2): 219–222. ^ a b c Satoh G, Takeuchi J, Yasui K, Tagawa K, Saiga H, Zhang P, Satoh N (2002). "Amphi-Eomes/Tbr1: An Amphioxus Cognate of Vertebrate Eomesodermin and T-Brain1 Genes Whose Expression Reveals Evolutionarily Distinct Domain in Amphioxus Development". Journal of Experimental Zoology 294 (2): 136–145. ^ a b c d e f Bedogni F, Hodge RD, Elsen GE, Nelson BR, Daza RA, Beyer RP, Bammler TK, Rubenstein JL, Hevner RF (July 2010). 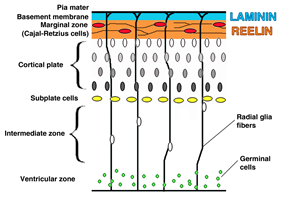 "Tbr1 regulates regional and laminar identity of postmitotic neurons in developing neocortex". Proc. Natl. Acad. Sci. U.S.A. 107 (29): 13129–34. ^ Kalscheuer VM, FitzPatrick D, Tommerup N, Bugge M, Niebuhr E, Neumann LM, Tzschach A, Shoichet SA, Menzel C, Erdogan F, Arkesteijn G, Ropers HH, Ullmann R. (January 2007). "Mutations in autism susceptibility candidate 2 (AUTS2) in patients with mental retardation". Hum Genet. 121 (3–4): 501–9. ^ Sultana R, Yu CE, Yu J, Munson J, Chen D, Hua W, Estes A, Cortes F, de la Barra F, Yu D, Haider ST, Trask BJ, Green ED, Raskind WH, Disteche CM, Wijsman E, Dawson G, Storm DR, Schellenberg GD, Villacres EC (August 2002). "Identification of a novel gene on chromosome 7q11.2 interrupted by a translocation breakpoint in a pair of autistic twins". Genomics 80 (2): 129–34. ^ Wang GS, Hong CJ, Yen TY, Huang HY, Ou Y, Huang TN, Jung WG, Kuo TY, Sheng M, Wang TF, Hsueh YP (April 2004). "Transcriptional modification by a CASK-interacting nucleosome assembly protein". Neuron 42 (1): 113–28. ^ a b Büttner N, Johnsen SA, Kügler S, Vogel T (April 2010). "Af9/Mllt3 interferes with Tbr1 expression through epigenetic modification of histone H3K79 during development of the cerebral cortex". Proc. Natl. Acad. Sci. U.S.A. 107 (15): 7042–7. ^ Pombero A, Bueno C, Saglietti L, Rodenas M, Guimera J, Bulfone A, Martinez S (2011). "Pallial origin of basal forebrain cholinergic neurons in the nucleus basalis of Meynert and horizontal limb of the diagonal band nucleus". Development 138 (19): 4315–4326. ^ Kristiansen LV, Patel SA, Haroutunian V, Meador-Woodruff JH (2010). "Expression of the NR2B-NMDA receptor subunit and its Tbr-1/CINAP regulatory proteins in postmortem brain suggest altered receptor processing in schizophrenia". Synapse 64 (7): 495–502. ^ McCarthy DM, Zhang X, Darnell SB, Sangrey GR, Yanagawa Y, Sadri-Vakli G, Bhide PG (2011). "Cocaine alters BDNF expression and neuronal migration in the embryonic mouse forebin". The Journal of Neuroscience 31 (38): 13400–13411. ^ Kishimoto N, Shimizu K, Sawamoto K (2011). "Neuronal regeneration in a zebrafish model of adult brain injury". Disease Models & Mechanisms 5 (2): 200–9. ^ Jones TW, Jäger N, Kool M, et al. (July 2012). "Dissecting the genomic complexity underlying medulloblastoma". Nature 488 (7409): 100–5. Sheng, M.; Hsueh, Y. P.; Wang, T. F.; Yang, F. C. (2000). "Nuclear translocation and transcription regulation by the membrane-associated guanylate kinase CASK/LIN-2". Nature 404 (6775): 298–302. Stefanovska, A. M.; Efremov, G. D.; Dimovski, A. J.; Jasar, D.; Zografski, G.; Josifovski, T.; Panovski, M.; Jankova, R.; Spiroski, M. (2001). "TbetaR-I(6A) polymorphism is not a tumor susceptibility allele in Macedonian colorectal cancer patients. Correspondence re: B. Pasche et al. Type I TbetaR-I(6A) is a Candidate Tumor Susceptibility Allele. Cancer Res., 58: 2727-2732, 1998". Cancer Research 61 (22): 8351–8352.